Dimension Data, the USD 8 billion global technology integrator and managed services provider for hybrid IT, today revealed the findings of its annual CX (Customer Experience) Benchmarking Report. It urges organisations to address a “customer experience disconnect” that could cost a loss in business or put their business at risk in competitive markets where consumer loyalty is critical. This is resulting in an ‘artificial reality’, where companies are talking about CX, but not delivering on it, creating a gap between their CX ambitions and actual CX capabilities. The research also revealed that many brands are turning to technology to improve customer experience, but often without a clear strategy. Pranay Anand, Solutions Director for Customer Experience, Dimension Data Asia Pacific said, customer experience must be both top-down and bottom-up approach. 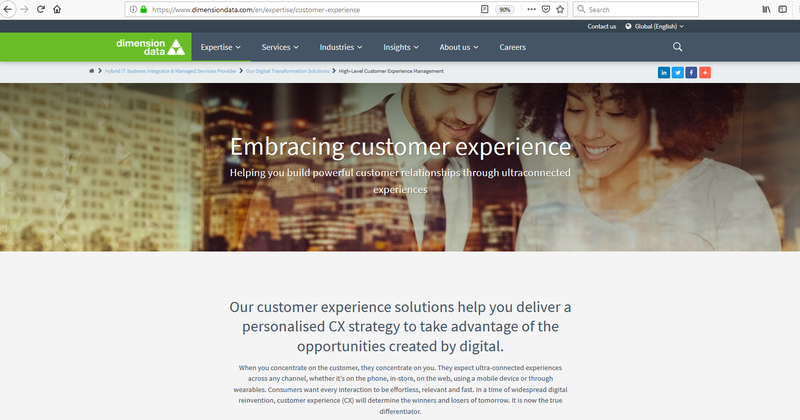 Dimension Data Global CX Benchmarking Report - The Report is an annual research study encapsulating more than 20 years of CX insights and trends. The 2019 Global Customer Experience Benchmarking Report contains insights from over 1100 respondents across 13 industries in 59 countries. Customer experience has always been taken for granted, particularly true to enterprise companies where the responsibility is literally delegated entirely to customer service departments alone, whilst smaller enterprise to SME wouldn't even employ a customer experience manager, nevermind vice president. In short, customer experience is important but it isn't revenue generating. Nonetheless, with the new concept of technology being the drivers of business, things are getting better when people realized that having good customer experience can actually bring in more stable and recurring revenues than hitting sales target. In many ways, micro SME serves the customers better because their approaches are encapsulated with better human touch. Besides top-down and bottom-up, I reckon that middle-burst approach is also necessary - a big enterprise would have middle management levels who would be effective leaders to drive such culture and they must not be ignored.